While this may be an interesting factoid, what we really care about is whether this has any real significance for the market. The Dow Theory is known by most technicians by how it defines the relationship between the Dow Jones Industrial and the Dow Jones Transportation index. But there is more to Dow Theory than just that. It also has a little known principle that clarifies the market at this juncture. While the 50% Principle bears Dow’s name, it was actually E. George Schaefer who introduced it and incorporated it into Dow Theory decades later. When I first learned of the S&P 500’s 50% retracement a few days ago, it immediately brought to mind Barron’s interview with Richard Russell, the editor of Dow Theory Letter, back in June 12th, 2000. For those new to Richard Russell, he is referred to as the “Sage of the Dow” for his long standing interpretation of the Dow Theory. He isn’t perfect by any means but his track record is impressive. Reading Russell’s answers almost 10 years ago left quite an impression on me. And re-reading them today makes Russell sound more like an oracle than a sage. Q: What are your indicators telling you now? A: As measured by Dow Theory and the PTI, we’re in the first phase of a bear market that could be long, tedious, grinding and very painful. Before it’s over, I believe we’ll see big pools of money moving out of stocks and into cash. I also believe we’ll see absolute slaughter in that dinosaur industry, mutual funds. There are now an absolutely ridiculous number of equity funds. In time they’ll be decimated, with literally hundreds of them closing down as investors bid them good-bye. Sound familiar? Remember, this was in the summer of 2000 when the technology and internet stock madness had overtaken Wall Street. We haven’t seen the “decimation” of the mutual fund industry (yet) but we definitely did see a stampede out of equities into cash earlier this year to the tune of $4 billion. PTI, by the way, stands for Primary Trend Indicator and is a proprietary index Russell developed. Q: By Dow Theory precepts, what index levels now are critical? A: In need to discuss Charles Dow’s “50% Principle.” He noted that what the averages do at the halfway level of a major rise or decline is important. The greater the move, the more important the 50% Principle. For example, I wouldn’t apply it to a move of a week or so covering maybe 100 points in the DJIA. However, for larger moves, this analysis is often helpful. According to the 50% Principle, if the Dow, after all its fluctuations, can settle and hold above the halfway level, there’s a good chance that this end of the see-saw will rise, allowing the index to test its prior high. But if the index, after all its fluctuations can’t settle above 10,759, then the odds are that this end of the see-saw will sink, taking the Dow down to test or even break below its March 7 low. In this event, I believe the second and longest phase of the bear market would be triggered. Recently, the Dow has been both a little below and a little above 10,759. Even if this battle is resolved on the upside, and the Dow heads for its prior peak, I recently had a terrifying thought. The next 10 years could be much like 1966-1974, with the market marching up and down in a wide trading range, never giving clear signals. Then the bear finally takes over and knocks the market to its knees. That’s about what happened during 1966 to ‘74. It was a very difficult and confusing period, with mini-bull and bear markets, and in the end, nobody made a lot of money. In fact, if they rose out the ‘73-74 collapse, they took the beating of their lives. 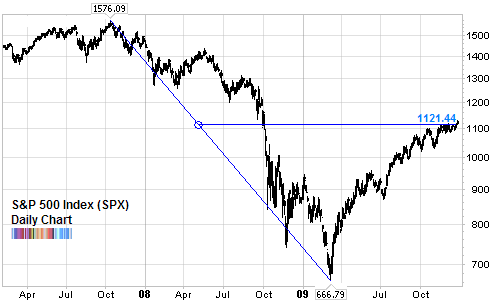 The 50% retracement for the Dow is 10,334 which it reached in mid-November and has since surpassed. By the way, if you’re wondering why the mid-point on the charts doesn’t look even it is because the scale is logarithmic rather than arithmetic. In any case, it provides us with a level to watch because if the market is able to stay above this level, then it has a better chance of moving higher. And if it quickly loses it, chances are we are heading back down. A few other thoughts on this: the very long term chart of the stock market suggests an 18 year cycle. Accordingly, we are almost through a very painful cycle which started in May 1999 (the top according to Richard Russell). My hunch is that we will have to make do with a volatile, but ultimately trendless market for the next 7 years. Finally, Mark Hulbert did a study of the veracity of the 50% Principle a few years ago in this article and found no convincing argument why it deserves our patronage. But as Hulbert himself admits, and as Russell reiterates in almost every interview, the Dow Theory is more an art than science. we never learn. if so, why rely on Dow Theory? Where does 10,759 is coming from? 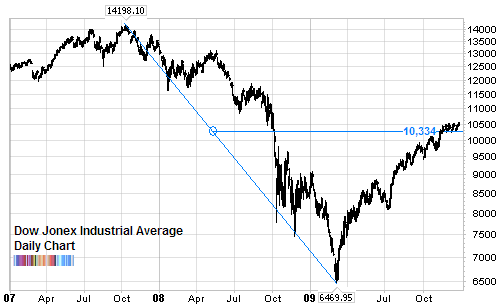 Juan, Russell mentions this level (10,759) for the Dow during an interview with Barron’s in the year 2000. That level was significant back then because it was the 50% retracement (high reached in January 2000 -11,750- and low in March 2000 - 9732).